The Dubbesi Restaurant at the Kempinski Hotel Giardino di Constanza Resort & Spa in Mazara del Vallo, Sicily, excels at capturing the rich flavors and intense colors of Sicily and the Mediterranean. The restaurant tables were luxuriously draped with cream and terracotta linens, cream napkins and copper charger plates, with exotic red anthurium floral arrangements and votive candles that provided a rich soft glow to the restaurant. Chairs covered in sand and yellow fabric, wraparound walls with French doors were sumptuously draped with the colors of Sicily: yellow, saffron and beige striped fabric, and a wrought iron chandelier with a leaf motif completed the Sicilian ambience. Edward F. Nesta and I dined at Dubbesi Restaurant in November 2005, where our evening began with gracious hospitality, as our waiters Gaetano, Alessandro and Nuccio, brought us cool cloths to refresh us, followed by an amuse bouche of goat cheese soaked in wine, accompanied with pumpkin chutney, and an assortment of rolls, served with Sicilian tapenade and olive oil. We selected the Involtini di gamberi e zucchini grigliate, paprika e arancio con pomodoro, melazane e provola, (Shrimp and grilled zucchini with pepper and orange with tomato, eggplant and provola cheese), and Carpaccio di polipo e sedano con terrina di pepperoni all’aceto balsamico (Octopus carpaccio with celery and bell pepper with balsamic vinegar) as our antipasti. The presentations were as appealing to the eye as they were to the palate. 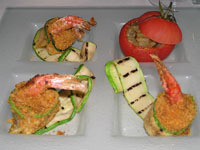 The shrimp were wrapped with a thin ribbon of zucchini and stuffed with breadcrumbs, and the tomato was peeled, cut in half, stuffed and then covered with the top of the tomato. The octopus carpaccio was served on a large square plate and consisted of six generous slices of carpaccio, with celery “spaghetti” arranged in a ball, with red and yellow pepper slices served in a wedge of multi-hued peppers. We paired our dinner selections with a 2003 Mandrarossa Furetta from Sicily, made with 60% Grecanico grapes and 40% Chardonnay grapes, that was a light straw color, with fresh apricots, peaches and vanilla on the nose, and was light, crisp, and slightly creamy on the palate. We continued with a primi piatti of Tortellone di pesce ed erbette da taglio nel suo ristretto con uvetta e pinoli (Sea bream tortellone with herbs, raisins and pinenuts), and Scaloppa du ricciola con vinaigrette rosa ai copperi e gamberoni griglianti, patate paglia e filetti di pompelno (Scalloped Ricciola fish with a pink vinaigrette of capers and grilled King prawns, light potatoes and grapefruit fillets). The large tortellone was filled with delicate sea bream and a touch of saffron, which provided a nice contrast to the sweetness of the raisins and slightly bitter spinach, while the pinenuts added another texture to this excellent dish. The prawns and tender sea bream dish was also superb, with its refreshing pairing of thin grapefruit sections. Before our dessert course, we had the opportunity to meet with Executive Chef Salvatore Barbara, who after traveling the world for ten years, has returned to his native Sicily, where he lives in Trapani. Together with his team, Sous Chef Giovanni de Candido and Pastry Chef Giovanni Ciotta, they create natural cuisine with Mediterranean flavors. His extensive global culinary experience includes studying with the renowned Chef Paul Bocuse in Lyon, France, and working in Asia and Abu Dhabi. For a sweet finale, we selected desserts of Cassata, (the famous Sicilian sponge cake), and Stella con parfait di mandorla, salsa vaniglia, e fragoline di bosco, (Almond parfait with vanilla sauce and wild berry sauce). 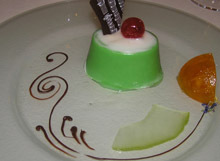 Cassata is made with fresh ricotta, which is a product of Sicily, and is the dessert that I most associate with Sicily. The almond parfait was served in a tuille pastry flower, with a vanilla sauce and a garnish of red currents, blackberries and miniature kiwis. We returned the following evening to experience another dinner at the restaurant, and had the pleasure of having Alessandro and Caterina as our waiters. We began with an amuse bouche of bruschetta with a quenelle of ricotta cheese garnished with chives and herbs, and warm rolls served with tomatoes and olive oil. We selected the antipasti of Mozzarella di buffala con rucola, sorbetto di pomodoro profumato al basilica con salsa all’aceto balsamico, (Buffalo mozzarella with rocket salad, tomato and basil sorbet with a balsamic vinegar sauce), and Polpettine di sarde con misticanza, pomodorini e vinaigrette al balsamico (Sardine fish balls mixed with salad, cherry tomatoes and balsamic vinegar). There were five generous slices of fresh mozzarella, with quartered cherry tomatoes and rocket salad, and the tomato sorbet had a fresh from the vine ripeness and was garnished with a sprig of rosemary. The traditional Sicilian fried sardine fish balls were made into quenelles and served with celery “spaghetti” a cherry tomato “flower” and two spoons filled with a balsamic vinaigrette reduction and a sauce of diced tomatoes. We continued with the Scaloppine di dentice al limone con pesce saltate e bouquet di fagiolini (Lemon scented sea bream escalloped with peaches and harticot verts bouquet, and Risottino carnaroli ai pistilli di zafferano, fiori di zucca e gambero di Mazara, (Carnaroli risotto with saffron and pumpkin flowers and Mazara prawns). The peaches were a delicious combination with the lemon-scented sea bream and the Carnaroli risotto consisted of three generous mounds of seafood-laden risotto and garnished with a prawn tail and a whole prawn. For a Secondi di Carne, Edward selected the Costolette D’agnello al rosmarino con timbaletto di melanzane alla menta e patatine paglia (Lamb chops with rosemary, eggplant timbale with mint and chips), which was beautifully presented, tender and very flavorful. For our dessert, we selected the Morbido al cioccolato profumato alla grappa con croccantino e perle di melone (Grappa scented chocolate mousse with a crusty biscuit and melon), and the Tiramisu aromatizzato all arancio servitor in coppa, (Orange scented Tiramisu). The tiramisu was presented in a goblet set on a plate that was dusted with a cocoa flower design, with chocolate “coffee beans”, ladyfingers and a spoon filled with chocolate gelatin. The Grappa scented chocolate mousse had a potent surprise in the form of a grappa-filled chocolate ball hidden inside the mousse. As a final surprise, our waiters brought us a plate of miniature cookies. 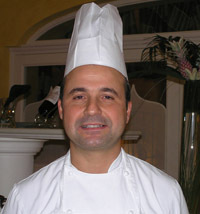 Executive Chef Salvatore Barbara will begin offering cooking courses at the restaurant, and we look forward to returning, taking a class or two, and learning a few of his secrets. In the meantime, we will try to recreate a taste of Sicily from his recipes that he generously provides in our Chefs’ Recipes section. Read our other articles on Sicily and the Kempinski Hotel Giardino di Constanza Resort & Spa in our Destinations, Spas, Hotels & Resorts and Wine Cellar sections of the magazine. For information on Sicily, Italy, please visit the Italian Government Tourist Board, www.italiantourism.com. © January 2006. Luxury Experience. www.LuxuryExperience.com. All rights reserved.